Days with events will be highlighted in green. The current day will be in a darker shade of green as highlighted above. A popup will appear with the option to update your profile time zone. Click Update to change this setting. We'll use this time zone when you create new sessions. 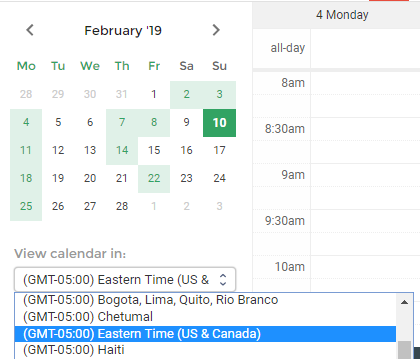 Select No thanks to temporarily change the time zone of the calendar without updating your settings. You can filter the events displayed on your calendar from the Display options section in the left navigation pane. These settings are specific to your current browser. Reschedule sessions and reminders by pressing and holding an event on the calendar. Next, move the event to a new time slot. You'll see a popup asking you to confirm the updated time.